Mr. English Coffee Blog. 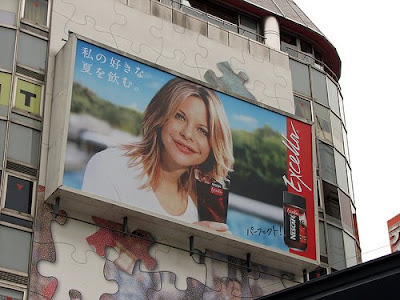 : Meg Ryan is sleepless in Japan because she's drinking instant coffee. Meg Ryan is sleepless in Japan because she's drinking instant coffee. I don't know if Meg Ryan is really drinking this instant Nescafe or just advertising it. Starbucks opened up in Japan just after her hit movie with Tom Hanks "Sleepless in Seattle". Because this movie was incredibly popular in Japan with young women and featured ever so many shots of Starbucks in the movie it was perfect timing when they opened their first stores in Japan shortly after the movie's release. Many stories were featured about Starbucks in the Mass Media as well and for awhile Starbucks was an instant success. The existing large Japanese Mega coffee co.'s were caught off guard by the newcomers instant popularity. Overtime though as they developed new themed cafes they are slowly regaining market share. Starbucks is still growing in Japan but it doesn't look as though they are going to end up with the same dominance that they did in the U.S. of the Japanese market. Nevertheless, Starbucks is here to stay in Japan unlike other fads and talent that come and go.